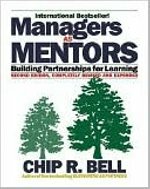 A hands-on guide that takes the mystery out of effective mentoring, this book by the author of the bestselling "Customers as Partners" helps managers establish trust, create a safe haven for risk taking, give feedback and support, and ensure the transfer of knowledge. Chip R. Bell is a senior partner with The Chip Bell Group and manages their office near <?xml:namespace prefix = st1 ns = "urn:schemas-microsoft-com:office:smarttags"> Dallas, Texas. Prior to starting CBG in 1980, he was Director of Management and Organization Development for NCNB (now Bank of America). Chip is the author or co-author of several best-selling books including Managers as Mentors.. His newest book is Take Their Breath Away. His work has been featured on CNBC, CNN, Fox Business Network, Bloomberg TV, and in the Wall Street Journal, Fortune, USA Today, Fast Company and Business Week. A renowned keynote speaker, Chip has served as consultant or trainer to such organizations as GE, Microsoft, CVS/pharmacy, Marriott, Universal Orlando, Ritz-Carlton Hotels, Harley-Davidson, Pfizer, Lockheed-Martin, Allstate, and Victoria’s Secret.